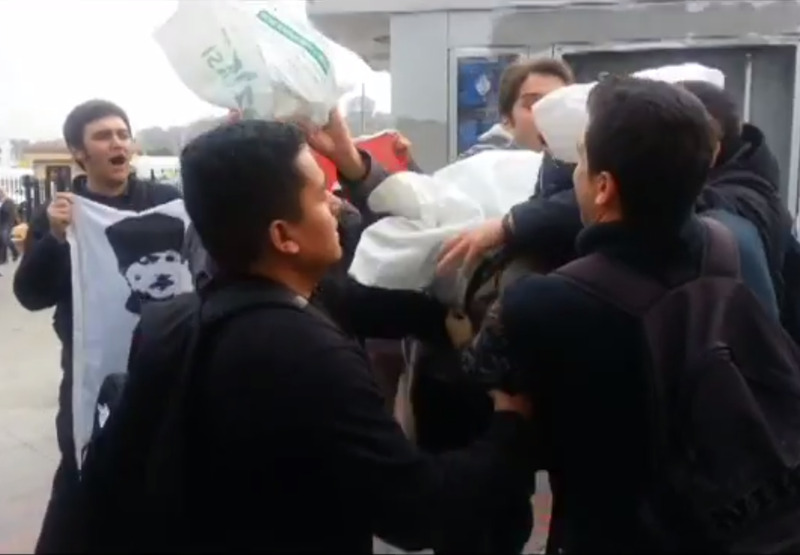 Three US sailors from the USS Ross were attacked in Istanbul today by radical Turks belonging to the Youth Union of Turkey (TGB), an extreme leftist organisation. The three sailors were confronted by a small gang of Turks belonging to the TGB in the tourist-frequented neighbourhood of Eminonu, in Istanbul’s historic Golden Horn. The mob began the confrontation with the sailors by saying “we define you as murderers, as killers,” in English. The TGB members then threw red paint on the sailors and attempted to hood them with cloth bags. During the encounter, the gang chanted “Yankees go home,” also in English. The confrontation was filmed and placed on YouTube and the TGB featured an article on their website proclaiming the incident as a successful effort against US imperialism. Today’s attack on three Sailors from the USS Ross in Istanbul is reprehensible. We are certain the vast majority of the Turkish people and the Government of Turkey do not condone this act against these representatives of a friend and ally. We understand that local law enforcement have suspects in custody. We commend this swift action and are certain that those who did this will be held accountable. We have long-enjoyed a strong relationship with Turkey for many years. As NATO allies, we share common interests, and this incident will have no impact on that strong relationship. Turkish ports have long been very popular destinations for U.S. Navy ships, and our Sailors have enjoyed the warm hospitality that has traditionally been extended. The group was formed in 2006, and is strictly against any form of internationalism. The TGB opposes the US and are against Turkey’ joining the European Union. They are also opposed to the ruling AKP party headed by President Recip Tayyip Erdogan. The video of the incident is below.